Saturday, 18 May 2019 at 9:00 PM . 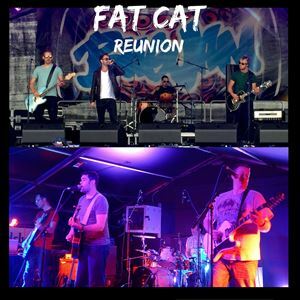 So the old manager of Fat Cat and Fat Cat resident DJ Omar have decided to get together to put on a reunion! Excited yet? Slim 47 are a 4 piece, indie/rock, covers band based in Northampton. They play anthemic tracks from bands like Foo Fighters, Red Hot Chili Peppers, Oasis, Blur, Kings of Leon and Killers to name just a few. They have built a reputation as being one of the best cover bands around. With their full on set consisting of the biggest indie/rock hits from the past two decades, coupled with a confidence in front of any size crowd, they always keep the venue busy. When it comes to delivering high quality live entertainment at your most meaningful occasion or function, Whiteroom are industry leaders. As a four piece, they specialise in contemporary rock and pop music performance alongside providing a professional audio setup to suit any venue. Doors will be from 9pm - 2am on 18th May. It would be great to get some old faces back together.